Sometimes referred to as Montecristo Yellow, these hand-rolled premium cigars use the finest tobacco binders and fillers from the Dominican and crafted individually by talented and high skilled cigar rollers known as Torcedos. This style of the Montecristo premium cigar line has a silky, golden-brown leaf that wraps up the fine tobaccos inside, and upon each draw, produces a combination of savory flavors that yields a satisfying smoke with a smooth aroma, and creamy finish. 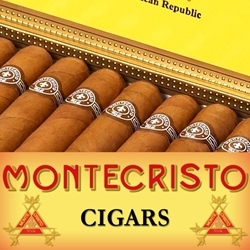 Montecristo hand-rolled premium cigars make a great addition to any cigar connoisseur’s humidor. Smokers Discounts has made it easy and affordable to buy premium cigars online. A variety of sizes and flavors are listed below at our discount online cigar store. Each of these styles are in stock and available. Call us for more details!